Don't pull out the hair forcibly to avoid causing pain of your petrify the pet has hair bond seriously, cut the knot short first and comb then. When long using, please use oil to protect the pin teeth. Keep it away from your pet or your small child when not using. As an honest Amazon Seller, we make our best to give you the best service and good-quality goods. If there are any problems with the business or if you are unsatisfied with us or our products, please feel free to contact us. If you are satisfied with our items and service, please take one minute to leave a positive feedback with 5 stars rating for us. We would be profoundly grateful! Your recognition drives us to do better and better job for you! The blade rake is designed to reduce shedding better than any brush, comb, or rake. 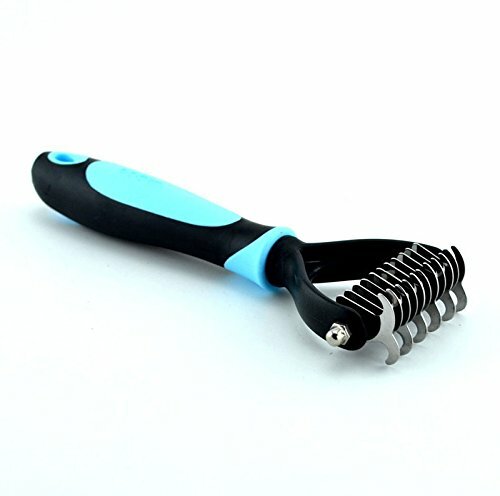 This tool works effectively for all shedding breeds of dogs and cats. It can handle both long-haired and short-haired pets. The rake is with two sides of blades, so the rake can gently remove knot hair easily. The broaches are made of stainless steel. The handle is made of TPE and PP, that does not cause your skin allergies than other material. If you have any questions about this product by SF Net Trading, contact us by completing and submitting the form below. If you are looking for a specif part number, please include it with your message.